As he took the podium, David Hind could take considerable satisfaction from the vista before him. Arrayed at his feet in a gigantic auditorium inside London's Twickenham Stadium were the leaders of some of the world's most powerful armies and weapons manufacturers. 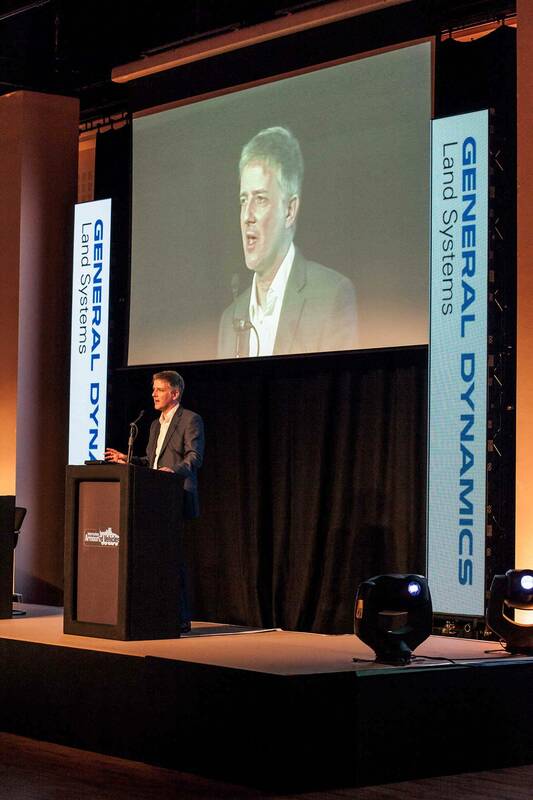 They had joined Hind in January for a conference on armoured vehicles, an industry that Hind's employer, General Dynamics Land Systems Canada, all but dominates. "Our Canadian production line has been running continuously since the 1980s," Hind boasted, after explaining that GDLSC's plant in London, Ontario, has sold 10,500 fighting vehicles to 10 countries. "Whatever the challenge is, we've been there and done it." And then it was showtime. To the accompaniment of thundering music, Hind rolled a video promoting GDLSC's showpiece, the Light Armoured Vehicle 6. The polished production showed the LAV in a multitude of fighting situations: The eight-wheeled, 30-tonne behemoth can travel at high speed over rough terrain while pumping lethal force through its cannon and complement of machine guns. As the lights came up, Hind asked his audience, "What's not to like?" 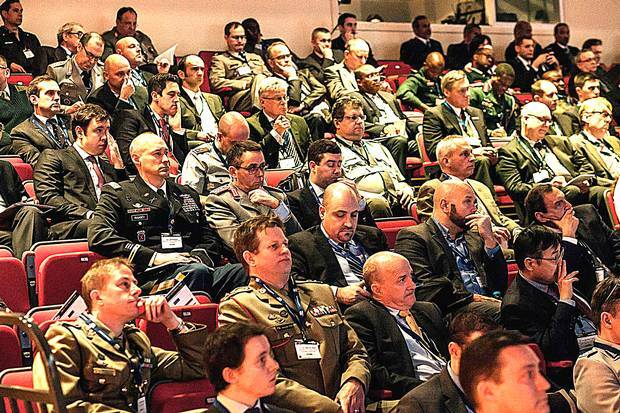 Delegates to the International Armoured Vehicles Conference in London. For this crowd, it was a rhetorical question. But as powerful as Hind's presentation was, the preceding speaker was even more potent: Colonel Glenn Dean, manager of the U.S. Army's 3,700-vehicle LAV fleet. Dean delivered an unequivocal endorsement for GDLSC's machine, which in the U.S. is called Stryker. The only real doubt Dean had was whether the multipurpose vehicle should be called a "personnel carrier" or an "infantry fighting vehicle." For Hind, Colonel Dean's praise—invested with the authority of the U.S. Army—was the ultimate stamp of approval. 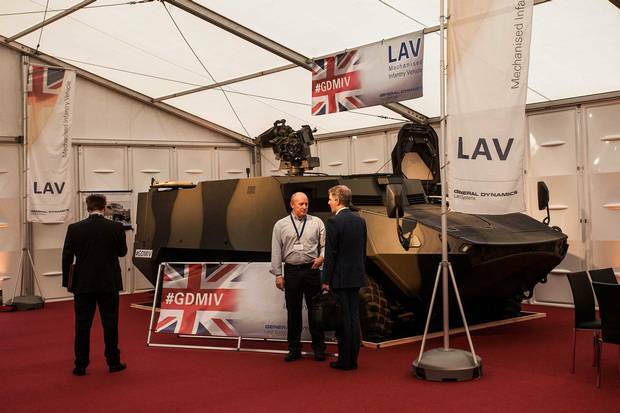 As GDLSC's director of strategy in the United Kingdom, Hind's quest is to persuade the British Army to select the LAV 6 for a multibillion-dollar contract over competing models from manufacturers in Finland, Germany, France and Singapore. Seemingly no expense was spared in this campaign: GDLSC even shipped a LAV 6 to the U.K. and sent it on a cross-country trek. Even so, the sales pitch was selective. When taking questions on the podium after his pitch, Hind was reluctant to get into certain details: "Let's talk about that outside," he suggested to a ripple of laughter in the auditorium after I asked him for the LAV 6's sticker price. Despite all the hyperbole, Hind also had nothing to say on the biggest coup in GDLSC's history: the sale of $15-billion worth of LAVs to the Kingdom of Saudi Arabia's National Guard in 2014. 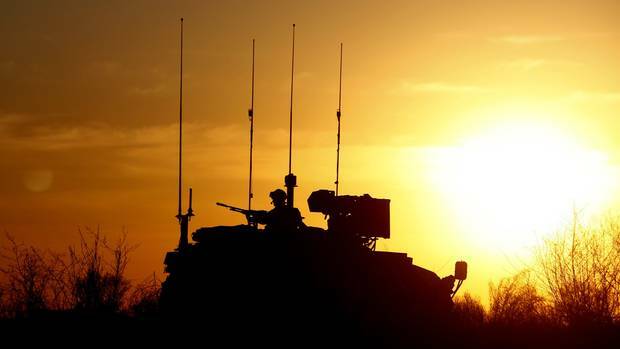 The deal is akin to a holy grail for anyone in the armoured-vehicle industry. But like the federal Conservative government that forged the deal, and like the Liberal successors who now stand by it in the face of a growing chorus of political and legal challenges, Hind—along with his colleagues at GDLSC and at General Dynamics headquarters in Virginia—emphatically resisted peeling back the mysteries surrounding the transaction that Conservative Trade Minister Ed Fast called "the largest advanced-manufacturing export win in Canada's history." Like darts targeted with growing accuracy at a highly political bull's eye, the questions have accumulated, unanswered, ever since the deal was publicly announced in early 2014: How many LAVs are the Saudis buying from GDLSC? What weapons will be mounted on them? How will the Saudis use the vehicles? Is the sale legal under Canadian law? Why did General Dynamics, a U.S. corporation with annual revenues exceeding $30 billion (U.S.), need the federal government's Canadian Commercial Corp. (CCC) to backstop the deal? What exactly was CCC's role? And why will neither GDLSC nor CCC allow their employees to discuss any aspect of the deal? Although Canadians may like to think of themselves, at least nostalgically, as a peacekeeping nation, we have a large defence industry—all the more so, relatively speaking, as other sectors have withered in the face of globalization. And the future looks good for Canadian arms manufacturers. In the view of Christyn Cianfarani, president of the Canadian Association of Defence and Security Industries, a 2008 $490-billion federal plan for military investment, including new ships and fighter planes, could "define the future of our industry for a generation." But domestic sales are just half the story. According to a 2013 report prepared for Ottawa by a panel headed by Tom Jenkins, executive chairman of Waterloo-based Open Text Corp., Canadian defence-industry revenue is almost equally split between domestic and export sales. The sector in 2011 comprised more than 2,000 companies, over 70,000 employees, and an estimated $12.6 billion in annual revenues. Among these 2,000 companies, only a few, such as Bombardier, CAE and SNC-Lavalin, are well-known Canadian names. The overall sector shows its roots in the expansion of the American industry in the middle of the last century. Ever since, the U.S. has been the world's largest arms manufacturer and exporter by a wide measure. Thus, domestic players in the Canadian industry are overshadowed by subsidiaries of American companies such as General Dynamics, L-3 Communications, Lockheed Martin, Raytheon, Textron and United Technologies. The sector's Canadian-owned companies tend to be low-profile, small and medium-size producers of components for the American subsidiaries. They're typically located in Southern Ontario's manufacturing heartland, reflecting the industry's interlocking history with the auto and tech sectors. An in-depth explainer on the $15-billion deal. When Canadian companies do innovate, they tend to get acquired by U.S. and European heavyweights in whole or part. For example, L-3 Communications, whose 38,000 employees worldwide generated net sales of $10.4 billion (U.S.) in 2015, took over Spar Aerospace in 1999, Wescam in 2001, Bombardier's Military Aviation Services in 2003 and CAE's Marine Controls unit in 2005. It's a unique industry, the Jenkins panel report noted, "in that governments are essentially the only customers, and have flexibility under international trade agreements to favour domestic suppliers." That means that "a nation's defence industrial capability is inextricably linked to government policies and practices." The government policies that matter most, of course, have to do with defence expenditures. These totalled $1.8 trillion (U.S.)—roughly 2.3% of global GDP—worldwide in 2014. In recent years, defence spending in the United States—which absorbs roughly three-quarters of Canadian defence exports—has dropped 20%. Meanwhile, new markets in the Middle East, South and East Asia and South America were projected to grow about 40% between 2009 and 2016. Not surprisingly, many exporters are pivoting toward these markets—especially the Middle East, where the Canadian Commercial Corp., a Crown corporation established to assist defence exporters following the Second World War, energetically seeks new contracts. Alongside Export Development Canada, the federal Crown corporation that insures and finances private-sector export deals, CCC has a long track record of stewarding defence deals. CCC may be publicly owned, and the beneficiary of hundreds of millions of dollars in federal subsidies over the decades, but it would not allow its president and CEO, Martin Zablocki, nor any other officer, to be interviewed. However, Zablocki spoke frankly in a 2015 interview with The National, a United Arab Emirates newspaper. "For us in Canada, we serviced the U.S. for many years—and this is an area where definitely their budgets are going down," Zablocki said. "So with [that] dynamic and with the money being spent in the Middle East, it's a strategic region for Canada on many fronts." As CCC's corporate plan elaborates, "in every country where a material rise in defence spending has occurred since 2004, one of the identified drivers of the increase in spending has been attributed to the involvement of that nation in significant armed conflict or other violence." The 2014 deal with Saudi Arabia, the plan explains, provided "tremendous momentum." David Hind, right, with a LAV at the London conference; his current brief is to persuade the British Army to buy. The $15-billion LAV contract with Saudi Arabia is by far the biggest example of CCC's value proposition in action. By acting as purchaser on behalf of the Saudis and vendor on behalf of GDLSC—a classic middleman collecting a fee—CCC recast the transaction as "government to government." Thanks to this legal alchemy, which CCC has widely employed, non-controversial Canada stood in Saudi Arabia's stead as GDLSC's client. CCC says in its buyer's guide that this arrangement reduces the risks "that would normally be associated with an open call for proposals, including the confidential nature of certain defence and security acquisitions," and "provides value across a balanced scorecard of success factors." Further details on CCC's value proposition are not available. Indeed, government lawyers completely censored a description of its value proposition within documents the corporation was obliged to release under the federal access-to-information (ATI) law last year. Such sweeping secrecy is intrinsic to CCC's culture, notes Patricia Adams, a veteran analyst with Toronto-based foreign-aid watchdog Probe International. Not even CCC's own board members—many of whom have backgrounds with defence and technology companies including CAE, Stratos Global, Spar Aerospace, Cascade Aerospace and software maker OMX—were permitted to see a 2012 external audit of the corporation requested by the federal government. Whatever the details of CCC's value proposition are, board member Martin Gagné told the CCC's annual meeting last December that it has been extremely useful to General Dynamics, the world's sixth-largest weapons maker, which purchased its London plant from General Motors in 2003. At an industry conference in the Ontario city last November, defence association president Christyn Cianfarani described GDLSC as "the anchor company in the London defence industry, not to mention one of Canada's defence industry crown jewels, recognized in this country and in many others for producing the best light armoured vehicles in the world." The front of the General Dynamics plant in London, Ont. What is perhaps less well understood, Cianfarani added, is that GDLSC "is at the core of a nascent defence cluster in this city and region, one which, according to the London Economic Development Corp., employs more than 12,000 highly skilled people working in 45 defence-related companies." Over the past decade, GDLSC's plant—which got its start making GM-brand armoured vehicles for the Canadian army in the 1970s—has delivered thousands of LAVs with a total sales value of $17 billion (not including the notorious new contract). The purchasers included the U.S. and Canadian militaries, as well as Saudi Arabia, which bought an estimated $8-billion worth of LAVs in three separate deals in 2006, 2009 and 2011. The benefits of the latest Saudi LAV deal will be spread among some 500 companies, according to federal officials. But the names of the subcontractor companies have not been released, and they are not eager to make their identities known. When word got out last year that Brampton, Ontario-based shock-absorber manufacturer General Kinetics was supplying parts for the LAV 6, the company's owner, Scott Griffin, a celebrated patron of the arts, quickly disassociated himself from his own company. The focus on armoured vehicles at General Dynamics and CCC is commercially astute, says Ben Barry, a retired British brigadier general and senior fellow at the International Institute for Strategic Studies in London, U.K. "Armoured personnel carriers are very attractive to a lot of countries," he explains after naming competitors to the LAV 6 made by BAE of Britain, Nexter of France, Patria of Finland, and Rheinmettal of Germany. GDLSC's success with the U.S. and Canadian armies lends its LAVs huge appeal internationally, notes Barry—and not just for military users. "These vehicles are very successful for internal security. Lots of dictators are putting them on the streets. The Saudi deal, for example, is not with the army but with the national guard—which is police and internal security." As GDLSC's David Hind told me prior to his speech at the armoured vehicle conference in London, the future augurs well for GDLSC. Raging cross-border conflicts and civil unrest have prompted a huge increase in sales of armoured vehicles in the Middle East, North Africa, South Asia and Latin America. GDLSC, said Hind, is in "a sweet spot." Former foreign minister John Baird. As it turned out, Hind wasn't willing to talk to me again "outside" after he descended from the stage at the conference. His colleagues at GDLSC headquarters also refused my interview invitation. Nor was a visit to the GDLSC plant permitted. This is all in keeping with a thorough-going strategy of obfuscation. Although General Dynamics mentioned its Canadian operation three times in its 2014 annual report, the words "Saudi Arabia" do not appear. Rather, the U.S. dollar-denominated report refers to a "$10-billion award to provide wheeled armoured vehicles, training and support services to an international customer through 2028." The shroud of secrecy extends to Ottawa, where at least three ministries, in addition to CCC, helped win the contract with the world's top arms importer. The initial legwork for the contract was done by John Baird, who visited Saudi Arabia as Canada's foreign minister in March, 2012. He made a return visit in October, 2014; Trade Minister Ed Fast also visited in both 2012 and 2013. 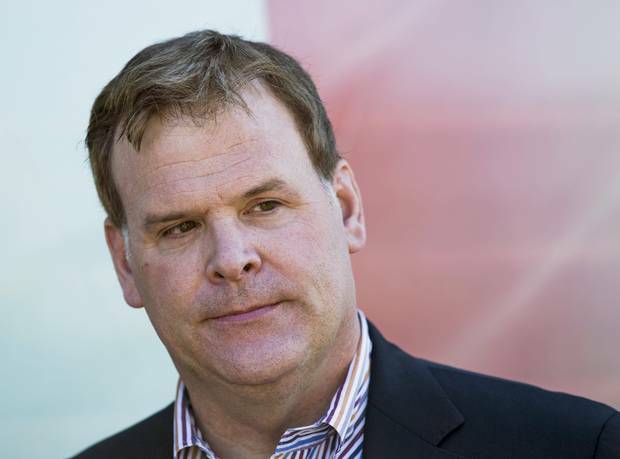 During his term, Baird also closed the Canadian embassy in Iran, which is Saudi Arabia's arch-enemy. 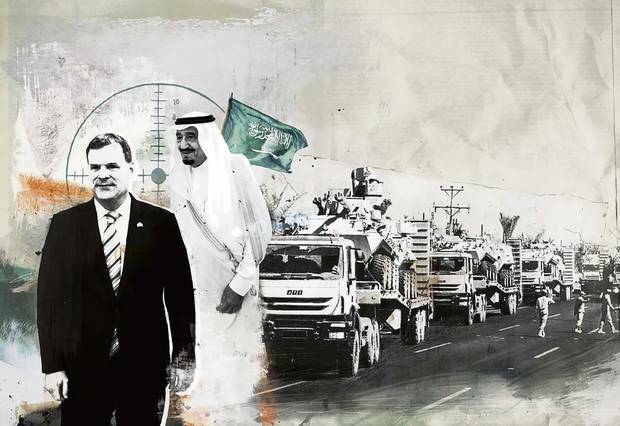 Baird even went so far as to tell the Saudi ambassador to Canada, in a 2014 meeting described in a document released under an ATI request, that Canada considers Iran to be "the world's greatest threat to peace and security." Business analysts worry this stance is now costing Canadian exporters dearly following the lifting of international sanctions against Iran this year. Some of Ottawa's reticence to talk about the LAV deal undoubtedly stems from Saudi Arabia's infamous human rights record: Under the House of Saud, there is no due process, no free press, severe repression of women's rights and gay rights, and systematic state violence against civilians ranging from mass executions to brutal suppression of dissent. The regime has also fomented wars in Syria, Iraq and Yemen. One of the few released documents relating to the deal that has not been fully obscured by censorship is an April, 2014, e-mail written by Anne-Tamara Lorre, a Canadian diplomat stationed at the United Nations in Geneva. Lorre told her colleagues at the Canadian embassy in Riyadh, the Saudi capital, that Saudi Arabia was resisting Canada's call at the UN for bans on child marriage, discrimination against women, judicially sanctioned corporal punishment and the execution of juvenile offenders. Meanwhile, scores of Canadian officials were scrambling to land the LAV deal. Whether from embarrassment at the Saudi human rights record or not, secrecy was explicitly written into the LAV deal. As Aliya Mawani, a Canadian diplomat based in Riyadh, explained in a January, 2015, e-mail, Canadian officials "would be breaking the terms of the contract" if details were made public. In another e-mail exchange in January, 2015, Brigette Walenius, deputy director with Foreign Affairs' Gulf-Levant-Maghreb Commercial Relations unit, cited General Dynamics officials who spoke of a "confidentiality clause in their contract with the Saudis"; she warned the Saudis "could terminate [the] contract if too much info is released." As The Globe and Mail has reported, the Saudis' insistence on secrecy reached all the way into the federal cabinet. When then-minister of state for foreign affairs Lynne Yelich was invited to speak about the deal at a 2015 event to celebrate a Saskatchewan-based company's role as a subcontractor, her speechwriter was advised not to mention Saudi Arabia by Lina Seto, a CCC official. Sure enough, Yelich's speaking notes contain no reference to Saudi Arabia. A security guard walks in front of three LAVs parked on the lot of the General Dynamics factory in London, Ont. Little is known about the lethality of the LAVs. But in an October, 2012, e-mail with the subject line "GDLSC lands the Big One," Canada's ambassador in Riyadh wrote that the LAVs "are going to be 'fully loaded.'" What that meant was revealed in a Jan. 21, 2015, memo prepared by an official in the Export Controls Division at Global Affairs Canada (formerly Foreign Affairs). The export permit indicates each vehicle could include turrets equipped with automatic firearms, smoke grenade launchers and "a coaxial machine gun in addition to its main armament." ATI documents also show that Ottawa announced the GDLSC deal before satisfying the federal law on exports of lethal weapons. When sales are proposed to countries "whose governments have a persistent record of serious violations of the human rights of their citizens," the government is obligated to obtain assurances that "there is no reasonable risk that the goods might be used against the civilian population." More than two years after the Saudi deal was signed, there is no sign of whatever assessments Ottawa made of human rights in Saudi Arabia. An ATI request for this article was met only by procedural stalling. Meanwhile, in February, the European Parliament passed a resolution stating that arms transfers to Saudi Arabia violate European arms regulations, and calling for an EU embargo. The government of Germany, which has been the world's third-largest weapons producer over much of the past decade, has been especially vexed by the issue. When Saudi Arabia wanted to buy a large fleet of Boxer armoured vehicles from Germany in 2012, the decision was reviewed under German law by Chancellor Angela Merkel and her Federal Security Council. In April, 2014, the council rejected the sale of 800 Leopard tanks to Saudi Arabia. And the following January, the government suspended all arms sales to the country. This news delighted officials at the Canadian embassy in Riyadh, according to a series of internal e-mails released under ATI. The German hesitation was just long enough to allow the Canadian sales job to swing the Saudi deal. As the sales effort unfolded, so did negotiations on the Arms Trade Treaty, a United Nations-sponsored pact aimed at imposing human-rights accountability on the weapons trade. Canada was one of a handful of countries—along with Saudi Arabia, Russia, China, Syria and North Korea—that declined to sign. The Trudeau government also hasn't signed the pact—although it says it intends to. 2003: General Dynamics buys London, Ontario plant from General Motors; it had been making armoured vehicles since the 1970s. 2006: Saudi Arabia buys armoured vehicles from General Dynamics. Further buys in 2009 and 2011 bring the bill to $8 billion. May 2009: Senior U.S. official Frank Ruggiero meets in Ottawa with officials representing Canada and the Canadian defence industry, who lobby for relief on arms export rules. March 2011: Saudi army suppresses Arab Spring protests in Bahrain using its existing fleet of Canadian-made LAVs. March 2012: Foreign Minister John Baird makes first of two visits to Saudi Arabia. 2012: Germany begins balking at sales of armaments to Saudi Arabia. February 2014: Deal reached for sale of $15-billion worth of General Dynamics LAVs to Saudi Arabia's National Guard. December 2014: Arms Trade Treaty comes into force; Canada is not among the signatories. April 2015: Saudi National Guard deploys armoured vehicles in Shia centres such as Qatif. December 2015: Two members of Senate Foreign Relations Committee push for tighter vetting of American weapons shipments to Saudi Arabia. April 2016: Liberal Foreign Minister Stéphane Dion signs LAV export permits. Perhaps the ultimate issue surrounding the LAV deal is not how it sits with Canadian lawmakers, but rather how it can be justified under U.S. export control laws. The International Traffic in Arms Regulations (ITAR), which are part of the 1976 U.S. Arms Export Control Act, require that Congress is formally notified 30 days before the U.S. can conclude a government-to-government military sale or issue an export licence for military goods valued at $14 million (U.S.) or more. The aim is to ensure that exported weapons don't end up being used against either U.S. forces or civilians abroad. Saudi Arabia has long been a hot file in this respect. In 1986, when President Ronald Reagan proposed the sale to Saudi Arabia of missiles, the Senate blocked the sales—a move Reagan then vetoed. During the Persian Gulf crisis in 1990, the first Bush administration triggered a congressional standoff when it proposed to sell $20-billion (U.S.) worth of weapons to the Saudis. A 2016 report from the Congressional Research Service says that since October, 2010, Congress has been informed of proposed Saudi sales including fighter aircraft, helicopters, missile defence systems, missiles, bombs and armoured vehicles, with a potential value of more than $100 billion (U.S.). But as these contracts proceed, congressional concern has intensified regarding Saudi Arabia's use of U.S.-made weapons (including armoured vehicles) to suppress dissent at home and in neighbouring countries. Here again, regional rivalries come into play. No less an authority than U.S. President Barack Obama recently stated that Saudi-Iranian rivalry "has helped to feed proxy wars and chaos in Syria and Iraq and Yemen." As the congressional report notes, civil protests in Saudi Arabia are growing, leading to clashes with security forces. Evidence of this is revealed on a video obtained from dissenters, showing troops using armoured vehicles to attack and destroy residential targets in Qatif, a city in the oil-rich Eastern Province, on April 15, 2015. According to Ali Adubisi, director of the Berlin-based European Saudi Organization for Human Rights, Qatif is ringed with troops and armoured vehicles. The Saudi Arabian National Guard published this photo on Twitter in November of 2015. It shows columns of combat vehicles being moved to Najran, a Saudi town near the border with Yemen. LAVs also figure in Saudi Arabia's interventions abroad. 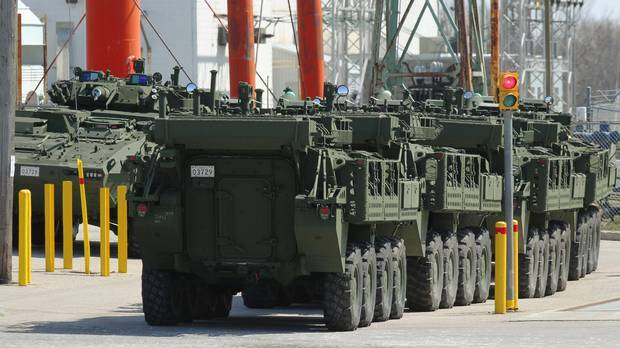 In 2011, during the Arab Spring, the Saudi army suppressed protests in Bahrain using its existing fleet of Canadian-made LAVs. More recently, the congressional report notes, "the U.S.-trained Saudi military has used U.S.-origin weaponry, U.S. logistical assistance, and shared intelligence to carry out strikes in Yemen." Given the stringency of the U.S. export control rules, and the fact that General Dynamics' foreign subsidiaries must abide by them under U.S. law, it comes as no surprise that GDLSC's 2011 sale of LAVs was reviewed under ITAR, and Congress was duly notified. But for GDLSC's 2014 deal, Congress wasn't notified. In other words, Congress was not informed of what proved to be the largest single weapons export deal won by a U.S. company in that year. topic Canadian officials will not publicly discuss. Sifting through the thousands of pages of documents regarding the LAV contract that have been released to date by CCC, Global Affairs Canada, the Department of National Defence, and the Department of Public Works and Government Services, it is striking that there is not a single reference to American military-export law. In an ironically revealing response to requests for documents relating to United States government "terms and conditions," CCC has confirmed that the volume of relevant records is so vast that an ATI review "would unreasonably interfere with the operations of the corporation." Despite calls to correct course from former Liberal cabinet ministers Irwin Cotler and Lloyd Axworthy, the Trudeau government stuck to the position that the deal is a private business transaction and could not be stopped. Yet, as the Globe's Steven Chase reported, the deal is proceeding precisely because Foreign Affairs Minister Stéphane Dion signed export permits for the LAVs on April 8. On a clear day, the United States is visible from the boardroom of Toronto law firm McCarthy Tétrault. So it seemed a fitting place to sit down with John Boscariol, one of Canada's handful of experts on how companies north of the border can navigate ITAR. As Boscariol possibly knows better than anyone else in Canada, the U.S. export control regime is a complex legal labyrinth. Those who get lost and incur the wrath of the U.S. government will almost certainly pay huge fines, or do jail time, or both. Adhering to ITAR gets tricky if you're a manufacturer supplying both military and non-military customers—"dual use," as it's called. As the panel on Canada's defence industry chaired by Tom Jenkins reported, "ITAR is particularly problematic for dual-use technologies, since even a single, small ITAR-restricted component renders any product that contains that component also ITAR-restricted." The report observed that, since the global market "comprises both ITAR and non-ITAR segments," many Canadian defence companies—especially those with dual-use technologies—"need to establish very sophisticated firewalls—in effect, ITAR and non-ITAR strategies—to ensure compliance for sales to third-country markets." In the late 1990s, Boscariol recalls, Washington, concerned that Canada had become a hunting ground for unfriendly nations seeking access to U.S. military technologies, suspended some long-standing exemptions to ITAR that Canada's industry had enjoyed. That led the Canadian government to quickly implement its own system of export controls. began quietly streaming their production into two channels: one for ITAR-compliant products utilizing U.S. components and technology, the other for products that were free from the long reach of ITAR. The push to get clear of ITAR is extremely sensitive for U.S. officials and politicians, Boscariol says. "They likely recognize that ITAR represents a competitive disadvantage for U.S. companies who must force their customers to be ITAR-compliant," he acknowledged. "But that doesn't mean they want U.S. companies to pursue workarounds to ITAR. And Canadian officials wouldn't want it to get out that they are actively discouraging use of U.S. technologies." 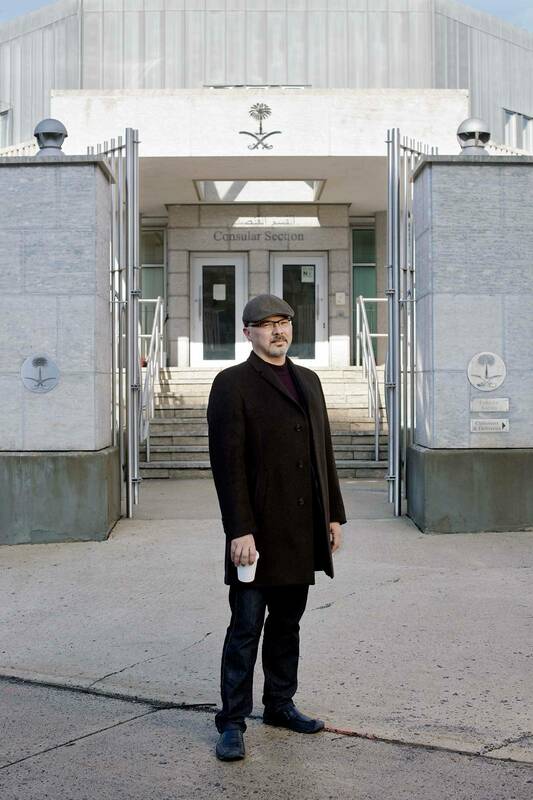 Although Boscariol agrees that many in the Canadian industry are rankled by the American export control regime, he says, "I've never seen anything indicating that the Canadian government—as opposed to industry executives—wanted to be ITAR-free." After telling me that, however, Boscariol revised his opinion while scanning a series of diplomatic wires sent from the U.S. embassy in Ottawa to the State Department in Washington. The wires, released by WikiLeaks, describe a May, 2009, meeting in which Frank Ruggiero, a senior State Department official in charge of political and military affairs, met in Ottawa with officials representing Canada and the Canadian defence industry. Ruggiero was vigorously lobbied by Canadian and industry officials to let Canada go ITAR-free. "Public Works and Government Services Canada Assistant Deputy Minister Jane Meyboom-Hardy observed that ITAR relief for industry is a 'top priority' for the Government of Canada," the diplomatic note states. "Department of National Defence Chief of Staff to the ADM for Materiel Jake Jacobson [now a vice-president at defence contractor Babcock Canada] attributed other 'unintended consequences' to the current implementation of [ITAR] in Canada that, he said, undermines bilateral defence relations," the note continued. According to the diplomatic note, Jacobson told Ruggiero, in words that astutely predicted GDLSC's success in competing against Rheinmetall, that U.S. allies like Canada and the U.K. "are seeking ITAR-free products. Being ITAR-free is not a ploy to permit sales to unsavoury regimes. Rather, it is seen as a useful way to ensure timely bidding and product delivery, as well as ease of post-delivery service on domestic procurements, and to compete with European manufacturers." At that point in the meeting, defence giant Lockheed Martin Canada's vice-president for business development, Don McClure, added that his company's "ability to develop Canada's new $2-billion combat ship systems integration without ITAR components was key to winning the contract in the face of European competition." The report then noted that Ruggiero said "that the U.S. is willing to consider extending to industry the government-to-government ITAR relief that State had negotiated with the Canadian Department of National Defence and other agencies in 2007." To John Boscariol at McCarthy Tétrault, this interchange was news. Boscariol also viewed the version of the CCC document concerning its value proposition that was released under ATI law. His reaction began with a burst of laughter. "I wonder why?" Boscariol marvelled as he looked at the entirely censored document. "Maybe they feel it's a competitive issue with regard to the strategies of other governments?" It appears that, after the Ruggiero meeting, his office did grant Canadian manufacturers the ITAR relief they sought—but that news of this exemption was not shared with American legislators. Steven Staples, a veteran Ottawa-based defence industry analyst, sees an agenda at work in the WikiLeaks wires. Staples has tracked GDLSC's sales to Saudi Arabia since 2009, when, as president of the Rideau Institute, a think tank dedicated to foreign-policy research, he first demanded the Canadian government curtail the company's transactions with the Saudis. "It used to be that Canada used the U.S. as a country of convenience for the re-export of weapons, because they were less restrictive than us," says Staples. "But now we've lowered our standards in order to become a country of convenience for U.S. weapons companies.…We've gone from being quite cautious about weapons proliferation to being quite irresponsible." In Staples's view, GDLSC's Saudi contract represents the culmination of a long push by Ottawa to attract investment from, and win business for, U.S. defence firms seeking freedom from ITAR's clutches, despite the laws requiring U.S. firms to notify Congress about large weapons export deals. "Once they got the ITAR issues resolved, they could easily rubber-stamp it through the Canadian export controls," Staples says. "Meanwhile, thanks to CCC, General Dynamics gets the Boy Scout stamp of approval that their deal was a sale to Canada, not Saudi Arabia." In Washington, Colby Goodman, a researcher at the Center for International Policy (CIP), a foreign-policy watchdog, shares Staples's concerns. "This is a very major U.S. deal and it has circumvented our system for reviewing such deals," Goodman says. "There is substantial concern in Congress now about much smaller deals with Saudi Arabia at a time when weapons exported there are being used against civilians in Yemen. And there is strong evidence that these weapons could be used domestically against civilians." Last December, an impending $1.3-billion (U.S.) weapons sale to Saudi Arabia prompted two senior members of the Senate Foreign Relations Committee to request, under new weapons export rules, that the committee be notified of future weapons shipments. The vetting will get more granular. "By invoking this new authority, the Senate committee is now saying that we want to monitor each shipment of the ordnance—and it's a lot of ordnance," an aide to the committee says. According to CIP research, U.S. arms sales to Saudi Arabia between 2009 and 2014 came to $13 billion (U.S.), the "highest of any country in the world during that time span." The number also illustrates the immensity of the GDLSC deal. Goodman doesn't question the legality of General Dynamics' actions: The relaxation of ITAR application in Canada, and the insertion of CCC with its "government-to-government" contract structure in between GDLSC and the Saudis, indicates to him that every legal precaution has been taken. Indeed, the document signed by Stéphane Dion to permit the export says, "the U.S. government supports this new program, and has issued the necessary export authorization to GDLSC." What Goodman does question is whether it is seemly for the Canadian government to be creating workarounds for U.S. weapons exporters seeking relief from U.S. export controls that are explicitly intended to permit the U.S. Congress to intervene to safeguard human rights and reduce conflict escalation. "If this deal was reviewed by Congress, it would generate very serious discussion and calls for thorough legal review," Goodman says. "Reporters and civil-society groups here in the U.S. would do some serious digging and call for congressional action to protect human rights in Saudi Arabia, and in Yemen," he adds. "But because this huge deal for General Dynamics is up in Canada without any congressional notification, none of that is happening." While Canada's sale to Saudi Arabia of armoured vehicles made by General Dynamics Land Systems is notorious—making it, to the exasperation of Foreign Affairs Minister Stéphane Dion, the first major bump in the road for a smooth-riding Liberal government—it is not the only LAV sale that required unusually staunch support from Ottawa. A previous sale to another problematic client, Colombia, paved the way for the Saudi contract. As in the Saudi deal, the Canadian Commercial Corp. (CCC) structured the 2013 $65-million sale of 24 LAVs as government-to-government. Thus the transaction fell outside the reach of American arms-export rules that would have brought it to the attention of Congress. U.S. weapons sales to Colombia were on Congress's radar at the time. The Colombian deal appears to have proven the CCC "value proposition" that would be instrumental in negotiations with the Saudis. The sale to Colombia also required the finessing of Canadian export control laws, since the violence-ravaged nation was not on Canada's list of nations approved for weapons exports—the Automatic Firearms Country Control List (AFCCL). Throughout 2012, General Dynamics and CCC campaigned to get that changed. In a June 27, 2012, memo to Peter MacKay and Ed Fast, who were the Conservative ministers of foreign affairs and trade, respectively, Associate Deputy Minister of Foreign Affairs Gérald Cossette explained that the request came as "demand from traditional markets for defence products has significantly decreased, forcing the Canadian defence industry to look for new market opportunities." To get Colombia onto the list, the government was legally obliged to conduct public consultations. Amnesty International and Project Ploughshares jointly objected to the proposal. "There can be no guarantee that arms transfers to Colombia will not exacerbate its human rights crisis," they argued. "Guerrilla groups, paramilitaries and the security forces continue to be responsible for crimes under international law, including unlawful killings, abductions or enforced disappearances, and forced displacement." Federal officials were unmoved: On Dec. 13, 2012, the Harper government announced that an internal consultation process, "including a review of potential human rights and existing conflicts issues," concluded with "the Government of Canada determining that Colombia was an appropriate destination for inclusion on the AFCCL." CCC officials were satisfied with their work: "We have worked diligently—across government…to speed Colombia's inclusion on Canada's Automatic Firearms Country Control List, which was approved last week," Jason Hann, chief of staff to the president of CCC, wrote in a Dec. 19 memo released under the access-to-information law. By that time, CCC and General Dynamics were on familiar terms: To get CCC's backing, General Dynamics allowed CCC to review its confidential financial statements. CCC apparently even allowed its client to set its fee: In a Dec. 6, 2012, e-mail that refers to Colombia's Ministry of Defence, Stan Jacobson of CCC stated, "GDLSC pricing submitted to the MOD Included [censored] fee for CCC. (They chose the amount)." In the final days of negotiations just before Christmas, 2012, Ministers Fast and MacKay were asked to lobby the Colombian government. Both ministerial offices became engaged; speaking points for MacKay were drafted by CCC. Whether CCC and General Dynamics ever called on this political firepower is unclear. But Colombia got the firepower it wanted: The contract was signed on Dec. 27, 2012.